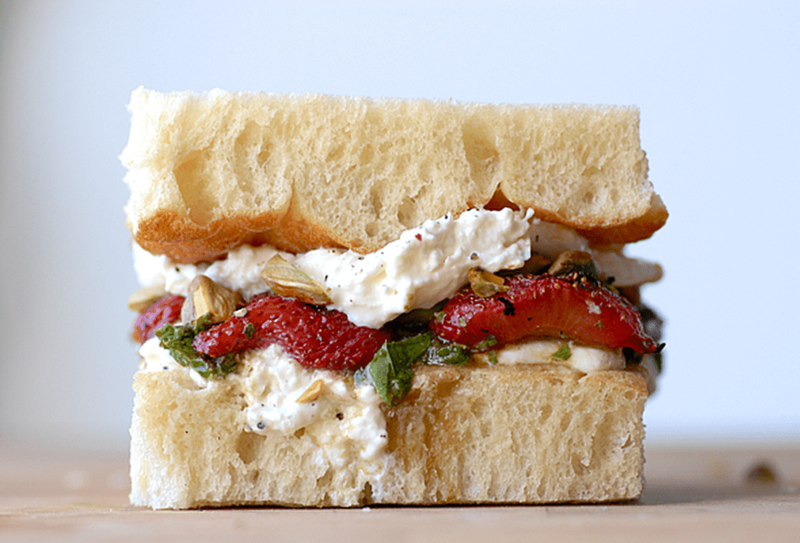 Fresh grilled balsamic glazed strawberries, cream burrata and a bright mint pistou make this sandwich perfect for summer. 1 square of Focaccia bread 4"x4"
Soak the halved strawberries in balsamic vinegar, cover and set aside. With a mortar, crush the garlic, pistachios, salt, pepper until paste forms. Grind the basil and mint in and add olive and lemon juice and stir. Or... just throw it all in the food processor. Over high heat, grill the balsamic vinegar soaked strawberries until they begin to show grill marks.You'll want the strawberries to retain their bright color so make sure not to leave them on for long. Now assemble your sandwich. Slice the focaccia in half and add half of the burrata. Salt and pepper it to taste. Now add the pistou, the strawberries and the pistachios. Add the remaining cheese and top with the other half of the focaccia. Butter both sides of the sandwich's exterior and set aside. In a medium sized skillet, heat the pan over medium heat. Add the buttered sandwich in and let it cook until the crust becomes golden brown and the cheese starts to soften. You'll see that burrata doesn't really melt but it will get warm and stretchy. After the sandwich has cooked on each side, remove it from the heat and let sit for a few minutes before digging in.